Join the RC Officials Tweet: Text “Join RCofficials” to 40404, as well. 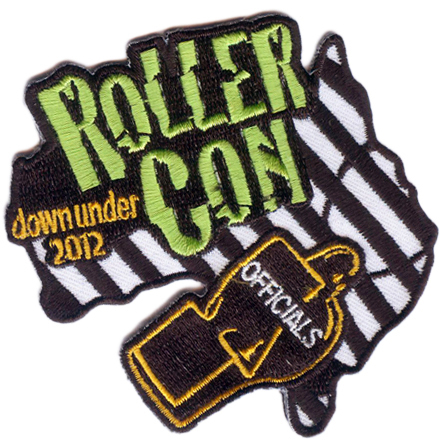 INTERESTED IN OFFICIATING AT ROLLERCON? Start HERE. Please check back here in June for more information about 2018 WFTDA Officiating Clinic. These photos were submitted by the subjects for RollerCon use. Credits below. All copyrights belong to the photographers and are not transferable. Do not repost. Before 2010, the job of 20 people was stuck on just one person. There is no way to thank these people enough for the hard work they did for RollerCon, or the nameless hordes of Officials they recruited without RC Planners even being aware of it. Its lame and so much less than you deserve, but we’ll try anyway. Thanks for everything, you guys. Did you take any of the photos on this page? Please let us know so we can give you credit for their awesomeness, or remove them (if you don’t want them on our site): planning@rollercon.com. Thanks! Allyaz in Action by…? Ack, she doesn’t remember! Is it yours? Email us!